The Nottingham Goose Fair is known as one of the UK’s most prestigious fairs, taking place annually at the Forest Recreation Ground with more than 500 rides and attractions. The history of the fair dates back more than 700 years, as huntsmen would use the event as a venue for selling geese to local villagers. Historical consensus says the fair started around the year 1285 as a trade expo, but these days it’s mostly known for its huge selection of rides that span the full amusement spectrum from thrilling to relaxing. When Is the Goose Fair? Nottingham’s famous Goose Fair takes place every year in early October, although there may be some slight variation in the exact opening dates. In 2018, the event will last from 3 Oct to 7 Oct. Visiting the official Goose Fair page on the Visit Nottinghamshire website is the best way to check an updated schedule, as the times are subject to change. Although there have been years when the event was shorter or longer, in recent years it has lasted 4 days, from Wednesday to Sunday. Typically, the fair will open late (around 5 PM) on the first day, stay open later on Fridays, and close earlier on Sundays. What Are the Best Goose Fair Rides? 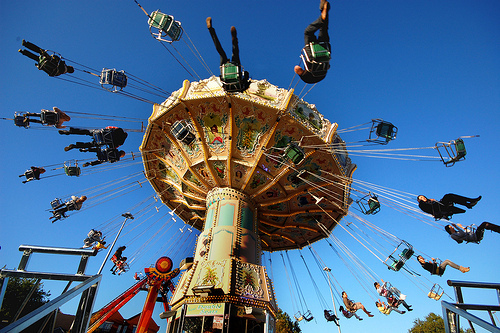 Although your favourite Goose Fair ride will vary depending on preference, in general the most exciting and action-packed rides have been Speed XXL, Airmaxx, XLR8, The King, AtmosFear, Star Flyer, Magic Mouse, and Reverse Bungee. In 2017, two new mega rides were shipped in from Dubai – The Magic and Giant Frisbee, and every year there’s something new to see for the people who have made going to ‘Goosey’ a yearly family tradition. Of course, then there are the more family-friendly rides like the Giant Wheel, Wild River, Dodgems, and Splash Mountain. There are also dozens of game stalls that offer up the chance to win prizes and compete with others for a good social rush. Many people opt to take the train instead of driving their cars to the fair because finding parking can be quite a hassle and can have you wasting time that could be spent having fun at the fair. The Nottingham Trams have extra routes that lead to the fair from all parts of town. While the event is usually somewhat crowded during all open times due to the annual attendance of hundreds of thousands of fair goers, the best times to avoid the bigger crowds would be extra early, extra late, and at the end of Sunday (the last day of the fair). Don’t Forget to Save Some Time to Explore! While in Nottingham for Goose Fair you’ll also want to get around to see a few other historic sites. Of course, Sherwood Forest would be on the list of sights to see, although you probably won’t see Robin Hood, but you just might see some of those legendary caves that were a vital part of the history of Britain. Then there’s Nottingham Castle and of course the Lace Market where you’ll find some of Nottinghamshire’s best restaurants, bars and the National Justice Museum. Yes, Goose Fair is the main attraction, but Nottingham invites you to spend a bit of time looking around before returning home. There’s a bit of something for everyone, so enjoy! Don’t miss this year’s Goose Fair – a treat you’ll not soon forget.